A proposed community solar farm for the Bega Valley on the south coast of New South Wales, is being looked at by the local council. Clean Energy for Eternity (CEFE) has put forward the solar farm proposal for construction at the Tathra Sewage Treatment Plant, in the town of Tathra. On a fittingly sun-filled day, the City of Aurora Mayor Pro Tem Marsha Berzins acknowledged the grand opening of the Aurora/Arapahoe Community Solar Array, the first community solar facility to serve ratepayers in the City Aurora and Arapahoe County, Colorado. Praising community-based renewable energy solutions as a key component of our renewable energy future, the mayor, along with representatives from the EPA, Xcel Energy and event host Clean Energy Collective, cut the ribbon on the 498 kW, 1,684-panel array. I'm really happy to see Aurora gain a solar garden, and proud of the work EPA is doing to put solar on brownfields. 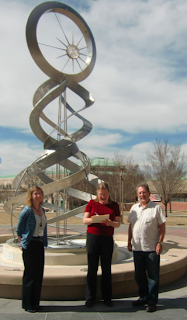 There were a lot of people (including me) involved in the process of bringing a solar garden to Aurora, and many twists and turns to the story! Solar Panel Hosting, Namaste and Solar Power Financial teamed-up to win 497-kilowatt projects in Aurora and Saguache County. Lake Region Electric Cooperative (LREC) members now have the opportunity to purchase part of the output from their newly-installed HQ Prairie solar project being built on the restored native prairie at LREC headquarters. The HQ Prairie solar array consists of 96 solar panels with a combined capacity of 39.36 KW or 39,360 watts. The array is expected to produce about 1.1 million kWh of clean, renewable electricity over the next 20 years. Each module has a nameplate capacity of 410 watts and will produce an average of 588 kWhs of electricity each year. 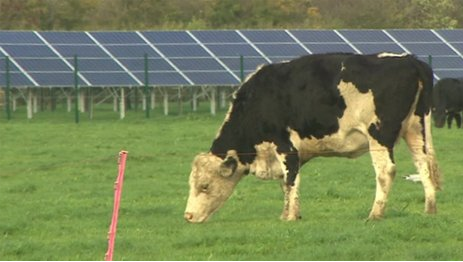 ... Next came the solar garden, which allows residents to purchase solar panels — at a reduced cost — in the cooperative’s growing solar array behind the company’s main building. The value of power generated on the panels is then deducted from the customer’s electric bill. LISTEN - Power Shift - Generating Community Solar Power | Public Radio International's "Living on Earth"
This is just what the doctor ordered for the folks who went through Superstorm Sandy! Microgrids with solar, storage, and generators can be community-owned, just like solar gardens, and can provide the resiliency needed to survive the recent uptick in severe weather and blackouts. On the afternoon of Sept. 6, 2013, intense thunderstorms blew into Borrego Springs, causing heavy rain, flash floods, high winds and severe lightning in the area. Lightning from the storm struck and shattered a power pole on the only transmission line serving the community, cutting electricity to all the town’s 2,780 power customers. SDG&E repair crews quickly arrived on the scene and worked throughout the night to restore power to all customers. But this wasn’t a run-of-the-mill power restoration, as crews were able to make use of a special advantage: SDG&E’s Borrego Springs Microgrid. A first of its kind in the area, this Microgrid uses new smart grid technology – including local power generation, local energy storage, and automated switching – to create a more robust, resilient grid that can dynamically react to the changing environmental and system conditions. The Microgrid is connected to the grid, but can disconnect and function independently during emergencies, supplying vital electricity to the local community through its on-site resources. The project is partially funded by the U.S. Department of Energy and the California Energy Commission. The state’s rapidly growing solar industry suffered a setback Thursday when the Arizona Corporation Commission narrowly voted to impose an average $5 monthly fee on new solar customers’ bills to make them pay for using the power grid. The 3-2 vote was a blow to the industry, which says it will make solar less affordable for people, and a disappointment to Arizona Public Service Co., which had sought higher fees to prevent non-solar customers from subsidizing solar users. Companies are capped at raising $1 million cap per year through crowdfunding. Investors with less than $100,000 annual income and net worth, could invest up to $2,000/year or 5 percent of annual income or net worth (whichever is greater). Investors with at least $100,000 annual income and net worth, investment amount levels rise to 10 percent of annual income or net worth (whichever is greater), and purchase no more than $100,000 of securities through crowdfunding. Non-U.S. companies are ineligible for the crowdfunding exemption, as are companies that already report to the SEC, some investment companies, those who aren't compliant with certain reporting rules, and others with no business plan or pending M&A deals. Securities purchased via crowdfunding can't be resold for a year. Under the proposed rules, issuers publishing notices advertising an offering can include terms: the nature and amount of securities offered, their pricing, and the closing date of the offering period. Women control 80% of household spending. And women spend a lot of time on the Internet. But many women feel misunderstood by marketers. To gain insights on how to market solar to the keepers of household budgets, Raina Russo and Glenna Wiseman have been conducting the industry's first woman-directed survey. They unveiled their preliminary findings recently at Solar Power International. What are the top 5 solar states to watch? They're not the ones you might expect. (Hint: Two of them feature community solar programs.) At Solar Power International, Cory Honeyman of Greentech Media identified some markets whose favorable regulatory landscape, state and utility incentives, and strong market fundamentals prime them for strong solar growth in the next few years. Logan County is looking at joining as a subscriber to the community solar garden Ecoplexus, Inc. is planning to install here soon. During a work session on Tuesday, the Logan County Commissioners met with Gary Eberhart, senior project manager for Ecoplexus, who talked about the steps involved in order for the county to determine whether it would be beneficial for them to join. At a meeting last month, the commissioners approved a conditional use permit to install a two megawatt community solar garden at Right of Way Road and Riverside Drive. At that time Eberhart said major subscribers they were working with to become part of the project included the Colorado Department of Corrections, Northeastern Junior College, the city of Sterling and Sterling Housing Authority. He was unsure if the county had been approached about being a subscriber. For solar advocates who live in apartments or have shady roofs, or those who don't have the means to install their own array but want to be part of the solar movement, there's community solar. But not so much in Pennsylvania. Community solar can mean several things, and all of them are difficult to accomplish in the state. At its most basic, it's a group of people chipping in to finance the installation of a single solar project. They could be donors, who receive no returns from the project. Or they could form a cooperative or even a for-profit company and reap the tax benefits of investing in solar. "Xcel Energy contends that there is "simply no advantage to forming a utility in the way that Boulder is attempting." This unsupported statement gives me pause and compels me to set the record straight." "The public power option is not new. Local communities have long had the right to own and operate their own electric utility or to grant a franchise to a private or investor-owned (IOU) utility. The reason to do so varies. Many communities choose public power because they want lower rates, or better reliability, or improved service. This freedom to choose how electric service is provided is a local rights issue and a cornerstone of consumer protection." When we think about renewable energy, we often envision futuristic technology and progressive ideas. When we think about rural America, we might picture older traditions rooted in an agricultural lifestyle. And yet, we are increasingly finding some of the most exciting examples of renewable energy development far from busy metropolitan centers. In particular, rural electric cooperatives, which provide power to sparsely populated areas of the country, are becoming increasingly involved in the politics of renewable energy and distributed generation (DG). Some stand in direct opposition to progressive energy policies or DG. Others, however, have begun to champion change. 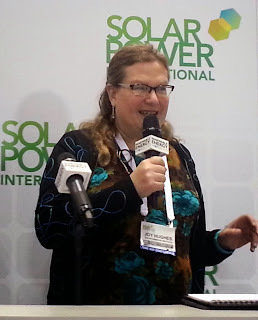 Introduction to community solar models including bulk purchase, crowdfunding, and solar gardens. Harvard, MA – October 25, 2013 - Harvard Solar Garden, LLC, the first wholly member-owned community solar electricity project in Massachusetts has begun to offer subscriptions to new members from communities supplied with electricity from National Grid in Central and Western Massachusetts. Unlike other solar PV projects, the Harvard Solar Garden offers individuals and small businesses the opportunity to share solar electricity generation through a unique direct ownership model. Phase One of the Harvard Solar Garden has been fully subscribed by Harvard residents and is expected to begin construction in the next month. Now, members of the broader community have the opportunity to benefit from solar generated electricity without having to install it on their rooftops. By purchasing shares in this Community Solar project, members can have the production of solar electricity generated by their share of the solar garden credited to their own meter and utility account as if the panels were mounted on their own roof. In addition to displacing the actual brown energy used from conventional fossil or nuclear based fuel, members receive the benefit of the state’s incentive programs through Solar Renewable Energy Credits (SRECs). Members may also receive the benefits of a grant from the Massachusetts Clean Energy Center, along with a Federal credit as a direct grant through the US Treasury's 1603 solar grant program. No new solar project today can still offer these incentives, grants, and 10 years of SREC I income, now fully subscribed at the State level. Solar Garden share benefits may be able to be transferred to another location or may be able to be sold or gifted to another party within the National Grid utility load zone. SREC I status allows the Harvard Solar Garden to obtain more valuable, but very limited, state incentive payments for solar. The Community-shared Solar concept allows members to benefit from solar generated electricity without having to install it on their rooftops. Shares in the Solar Garden cost $3.85/Watt installed, or less after incentives. The Harvard Solar Garden is being designed and engineered by Solar Design Associates of Harvard, MA – a firm with 38 years of dedicated experience in renewable energy systems engineering. There will be a community shared solar workshop open to the public on November 12, 2013 at the River Valley Coop community room. Contact the Customer Service Desk for times, and to pre-register. The development of a cooperative community solar project for our members is currently underway. While final details of the project are still being finalized, our cooperative solar project will involve the construction of a small solar project (25 kW) at our headquarters. We are in the process of soliciting member interest and participation after the cost of the panels, rate credit and operations/maintenance costs are determined. Members will then be offered to purchase the output of the solar project. While the actual price has not yet been determined, we do know that the price for the output of energy of these panels will be reduced by the upfront payment or investment for the tax incentives by Federated Rural Insurance Exchange. It is equally important to recognize that participating members will not qualify for the individual tax incentives because the tax value will have been incorporated in the reduced panel output price. Our electric cooperative will provide the insurance and maintain the operation for the entire life of the project, which is anticipated for 25 years. The participating members will receive a monthly credit on their electric bill based on the production and their participation in the community solar project. Various other reasons have been suggested for the snafu - lack of transmission, difficulty of interconnection, public opposition - but perhaps it is just the price (over $3000 an acre). Land in the SLV without senior water rights often goes for $1000 an acre or less. Solar companies might get a better deal (and less "green tape") purchasing land on the open private market. In any case, mid-scale solar power is alive and well in the Valley with over 80 MW installed, about equal to the area's peak winter load. I've always wondered if a solar panel could also store energy. It looks like we might be able to do this soon! According to the researchers, it should be possible to build cheap silicon supercapacitors out of the excess silicon contained inside many electronic devices. One such example are solar cells: supercapacitors built out of the silicon in the back side of solar cells could store energy during the day and gradually release it into the energy grid during the hours of peak consumption. This report is intended to help guide Michigan groups through the web of rules and regulations specific to Community Solar in Michigan, and provide up-front information to enthusiasts, community groups, and developers on how to successfully move Community Solar forward in Michigan. The numbers along the horizontal axis are the hours of the day. The fattening body of the duck shows the addition of more and more wind and solar power (WSP) over the coming years. More WSP is a good thing. But as the chart makes clear most of this will be available during the daylight hours, with very little during the peak usage period from around sundown to midnight. 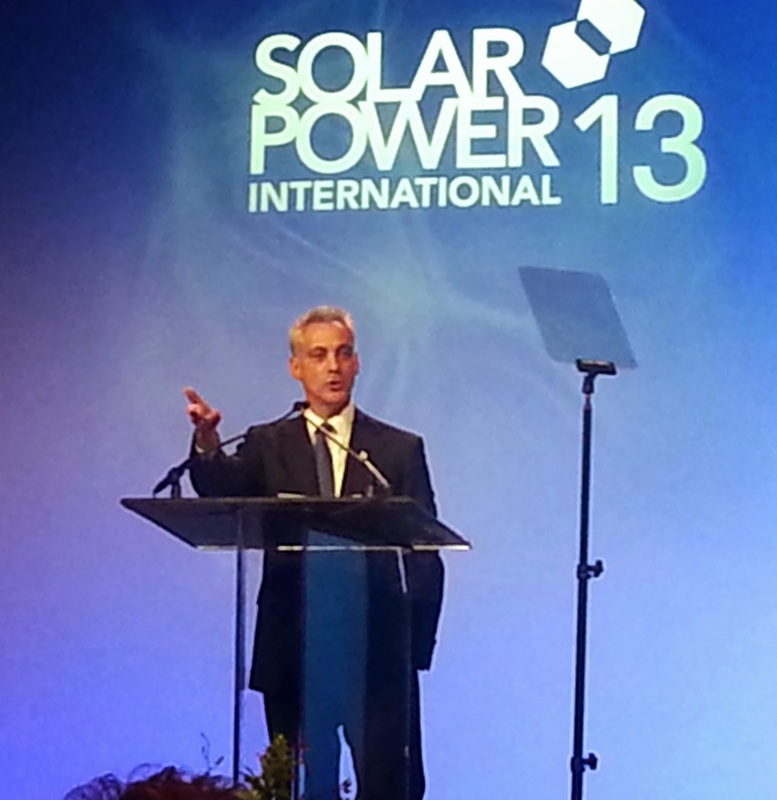 The tone was upbeat as Solar Power International kicked off in the Windy City on Monday this week. Speakers proclaimed that it's solar's time to shine, while cautioning that we must pull together to ensure the industry's continued strength. More from the amazing John Farrell! Germany is racing past 20 percent renewable energy on its electricity grid, but news stories stridently warn that this new wind and solar power is costing "billions." What is often left out (or buried far from the lede) is the overwhelming popularity of the country's relentless focus on energy change (energiewende). In northern New Mexico the sun shines nearly every day of the year. If solar energy is going to be viable anywhere, it will be here—and a small electric cooperative in historic Taos is taking advantage of it. In addition to supporting new solar projects in its service area, Kit Carson Electric Cooperative is offering its customers the opportunity to buy solar energy from "plots" in a "garden" of solar power generation. "A community renewable revolution in the UK..."
"Creating something that models community resilience as economic development." Rob Hopkins founded the Transition Towns movement. In the U.S. it seems to be all about local food systems ... but local energy is just as important. LONDON — For nearly a century, wealthy countries have relied on just one model of power distribution: sending electricity over huge transmission grids from big generating plants to customers in their homes, offices and factories. That may be starting to change. Renewable-energy technologies like solar and wind power, which in many countries have begun to shake up the mix of energy sources, are now also challenging the traditional distribution system. What do Boulder, Colorado and Hamburg, Germany have in common? Boulder, Colorado and Hamburg, Germany don't seem to have too much in common. One is a small, green-minded city at the foothills of the Rockies, the other one is the second biggest metropolis in Germany with almost 1.8 million people, defined by its busy harbor. But both cities share motivations to switch off their private utilities and switch on municipal power providers. At the Special Town Meeting next week, voters will face a "fish-or-fowl" argument when considering four articles related to the Harvard Solar Garden (HSG) and its request for a payment in lieu of taxes (PILOT) agreement and modified permitting and inspection fees. Voters are being asked for a decision now, before the Garden breaks ground at its location in the solar overlay district off Ayer Road and before solar incentives expire in December. Applying standard commercial fees and tax rates to a community solar garden is inappropriate, according to HSG project manager Worth Robbins, who is also a co-owner of the Harvard Press. "The Solar Garden shareholders did not expect the permit fee to be the same as an individual homeowner's fee, but we did anticipate some multiple of the single system cost would be applied to the shared system. The $17,000 fee is excessive." Robbins points to the Colorado model, where the Community Solar Garden Act created an entity distinct from residential and commercial systems. Under such a model, fees and taxes for a project like the Harvard Solar Garden would be less than standard commercial fees. California has passed similar legislation. The idea seemed to offer a solution for those who had wanted to participate in the 2011 Solarize Mass pilot project, but couldn't do so as individuals—whether for too little sun, the wrong orientation, or insufficient structural support. SEATTLE - Don't let the rain and the clouds fool you, Seattle City Light says this is the perfect place to harness the sun's power, and a new partnership with the Seattle Aquarium could soon give interested customers a break on their utility bill. The 49 kilowatt project is expected to produce enough energy to power roughly five and a half average-size homes in Seattle. Each 24 watt unit will cost customers $150, and City Light will allow each customer to purchase a maximum of 125 units. Everybody Solar has shared photos of their first project at Rebuilding Together Peninsula. Here's to non-profit community solar! Don't miss the premier gathering of clean energy advocates in the San Francisco Bay Area: The 4th Annual Conference of the Local Clean Energy Alliance. Check out the CONFERENCE PROGRAM! The Local Clean Energy Alliance is presenting the fourth annual Clean Power, Healthy Communities Conference, promoting local clean energy economies to ensure the economic development, employment, health, and resilience of Bay Area communities. In recent years many initiatives have emerged to promote decentralized clean energy. These initiatives support energy efficiency (Regional Energy Networks), feed-in tariffs, shared renewables, intelligent grid architectures, and innovative financing and repayment mechanisms, to name a few. Governor Brown’s call for 12,000 megawatts of local renewable power in California by 2020 has garnered widespread support. However, there continue to be few programs at the state level for implementing a decentralized energy vision. Many communities are looking to local leadership in energy procurement as a driver for decentralized energy development and equitable, sustainable energy solutions. At the heart of the matter is energy democracy: who controls energy development and for whose benefit. To democratize energy decisions, communities and grassroots organizations need to play an increasingly decisive role. The San Francisco Bay Area, with its strong advocacy organizations and many renewable energy programs, has provided leadership for local clean energy development on many fronts, including the promotion of Community Choice energy. The fourth annual Clean Power, Healthy Communities conference convenes advocates, policy makers, financiers, and entrepreneurs who support clean energy and healthy communities in the Bay Area. The conference focuses on finding solutions to the political and financial challenges of developing community-based energy resources and building sustainable, equitable, resilient communities. What’s at Stake for Bay Area Communities?